Italian pizza and football? Could there be a more perfect match? 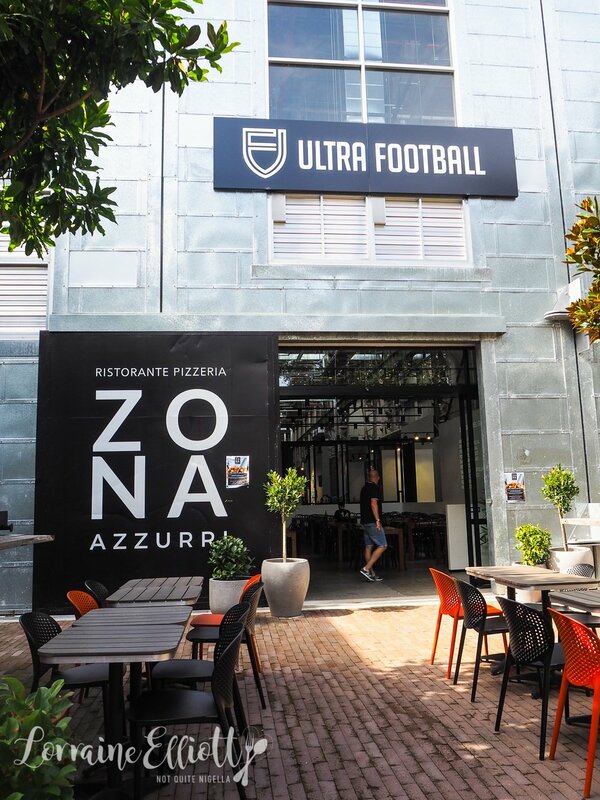 Zona Azzurri is quirkily located alongside a football mega store. On the menu are pizzas, pastas and everything that a football foodie could ask for! It was a recommendation from Ivy and Ryan that prompted a visit to Zona Azzurri. They had recently visited and raved about the pizza. 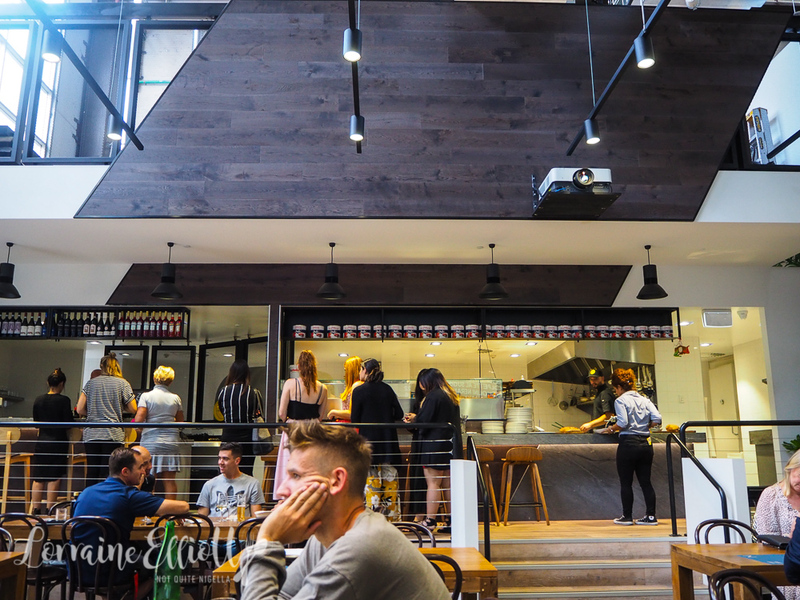 The partnership between a football store and a chef came about when chef Riccardo Bianchini, a lifelong football fan, was offered a space in which to open up a restaurant right next to a Ultra Football store. The word Azzurri pays homage to the Italian national football team, known as "gli azzurri" (or "the blues") while Zona refers to a tactic used in Italian football. 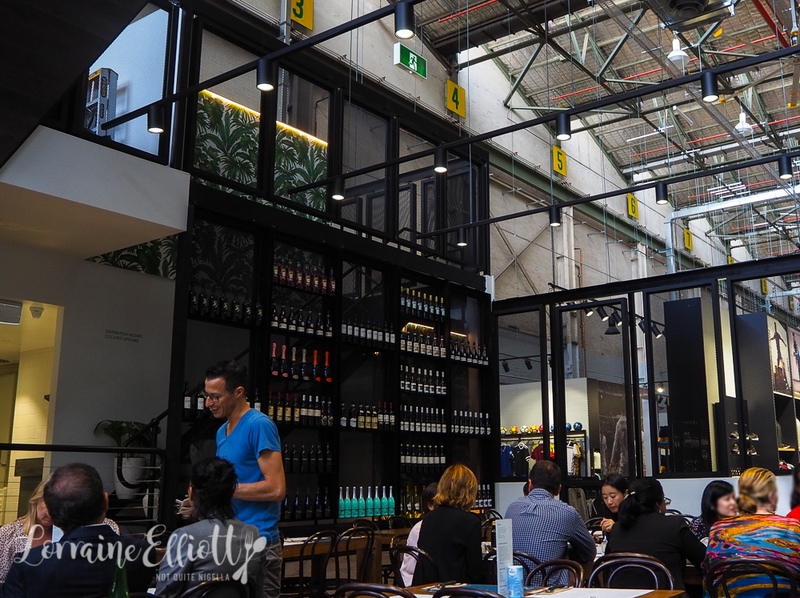 And despite the fact that it is situated at one side of a football store inside a businesspark (looks for the Rocks Brewing Company next door), it feels quite separate and like a proper eatery. Honestly, I envisaged having to walk through a giant football store and getting lost somewhere among sports equipment and being found a few hours later under a pile of soccer balls. I meet Girl Next Door one afternoon for lunch. 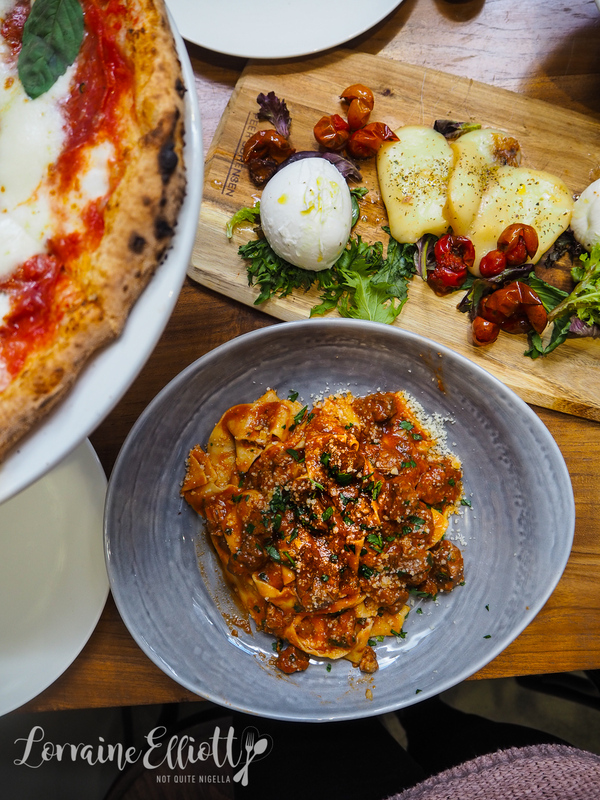 It's a cooler Sydney day and perfect for some pizza and pasta. "I'm not supposed to eat any of this," she says as she is on an F45 menu plan but honestly what is life if you can't eat pizza and pasta? She lets me order which I do quickly because I've already earmarked items from my research. There's a wall of specials projected but I miss them all entirely. Oops. 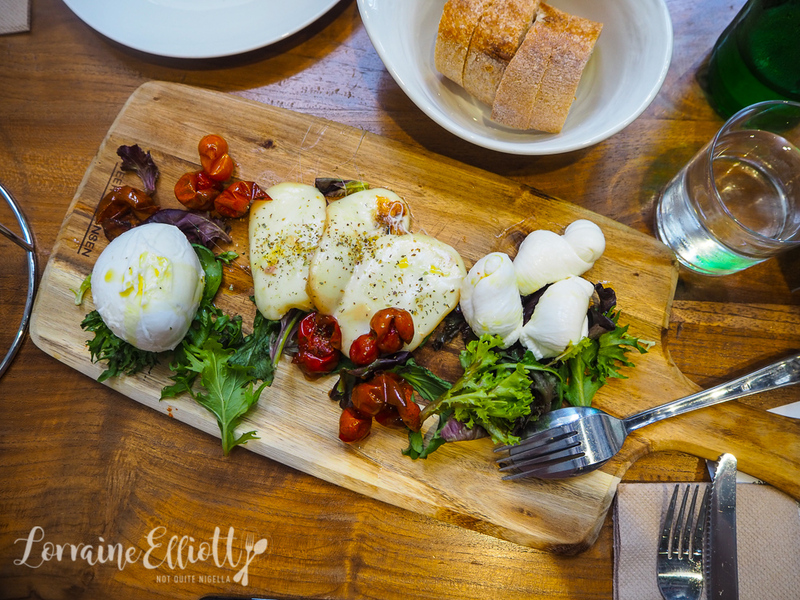 The first item is a tasting plate of 3 mozzarellas including Italian buffalo mozzarella, Australian scamorza (lightly smoked mozzarella) and three tiny burrata (made from mozzarella and cream). The scamorza is our favourite with its stronger, slightly smoked flavour. The tiny burrata are also nice but really the best bit about burrata is the cream filling and these don't have it. The buffalo mozzarella is fine but the least eaten out of all three. The blistered tomatoes are concentrated and sweet in flavour. 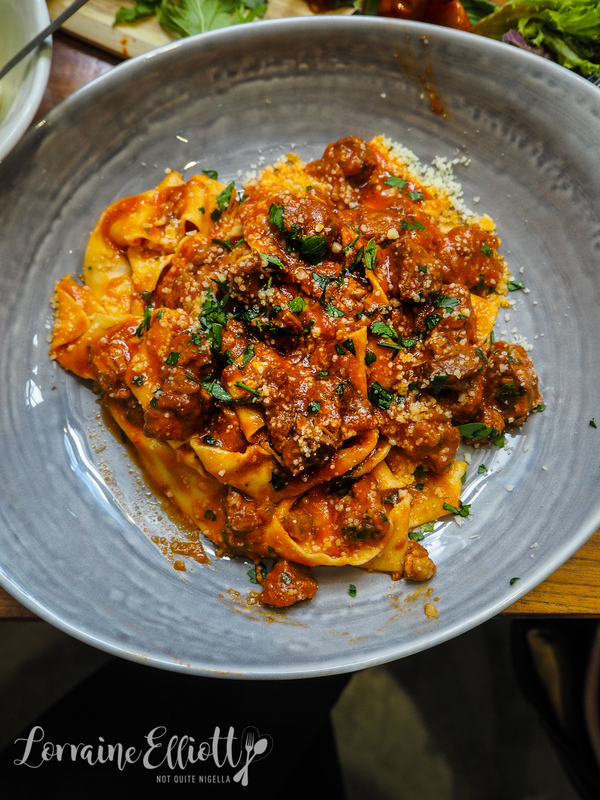 We both love pappardelle so we choose the hand cut pappardelle with slow cooked lamb in a white wine and tomato sauce. The pasta is silky and thin and the lamb chunks are so soft and tender. This is named after Head Chef Leonardo Alfieri's mother Lucia. The pizza is baked in a two tonne oven that was flown over from Naples. The pizza dough is made using a secret recipe from pizzaiolo or pizza chef Leonardo Alfieri where the dough is left to rise for over 65 hours. We order the Diavola with tomato, fior di latte, spicy sopressa and basil. "Why would they make pizza any other way than this?" says Girl Next Door. 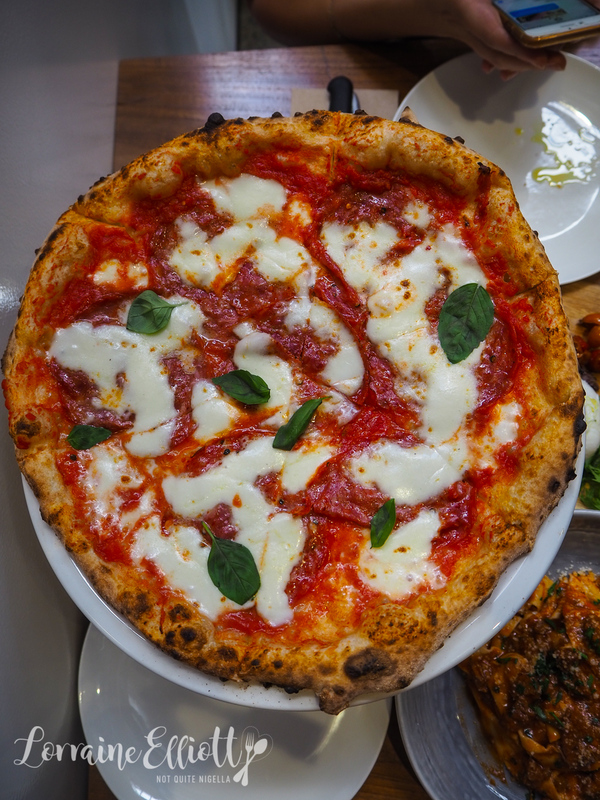 Ryan told us of one of his favourite ever things on a diavola pizza - a scoop of mascarpone that melts into the hot cheese and dough. Here they won't make any changes or half and halfs but they will give you a scoop of mascarpone on the side for $2. And although Ryan and I rarely see eye to eye on political matters I have to say that adding mascarpone is a great idea. In fact I only want spicy pizza with mascarpone now thankyouverymuch. "I don't think we should go with the pizza or the calzone," says Girl Next Door. But I was kind of hopeful for it so we choose one thing each and I go with baby sized Belgian white chocolate and fresh strawberries. There's a scoop of vanilla gelato on top as well and this is heavenly when it is hot from the oven with a good balance of creamy, rich and fruity. 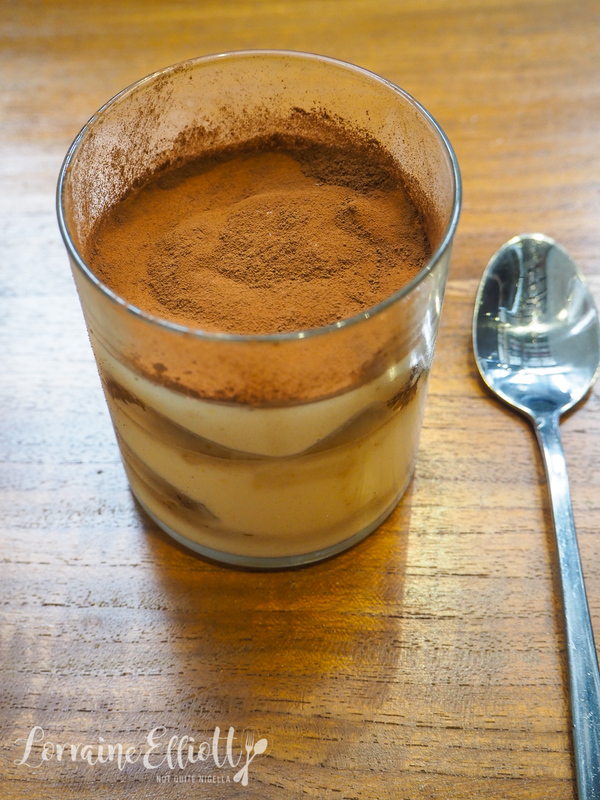 I am always tempted to order tiramisu because it's one of my favourite desserts. I like the generous blanket of chocolate on top as well as the coffee hit. So tell me Dear Reader, what are your two favourite interests? What do you think of the mascarpone with spicy pizza idea? 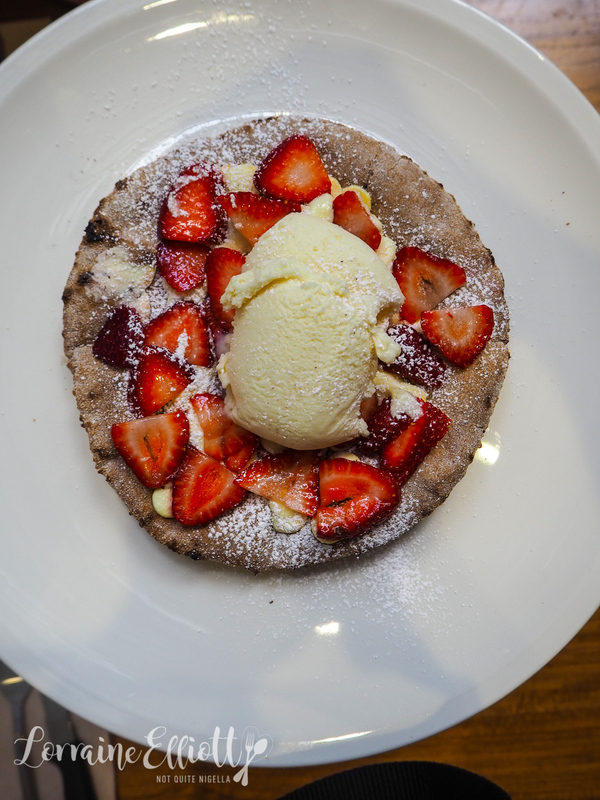 And do you often order a sweet pizza after a savoury pizza?